I have made a collection of Y-DNA haplogroup frequencies on Cyprus from various papers which is more comprehensive than the individual material available online, and I think may be of interest to some members. A large number of the Turkish results are based on 17 Y-STR results on which I was able to use Whit Athey’s Haplogroup Predictor – I included only those which showed a 95%+ probability of belonging to a particular haplogroup (including those which were distributed among various downstream markers of the same broader haplogroup, i.e. J2). A few of the Greek results did not clearly indicate a particular haplogroup – these results were excluded. I also excluded results from papers which only concentrated on a particular haplogroup or only focussed on a narrow range of haplogroups, as I felt these would skew the results. 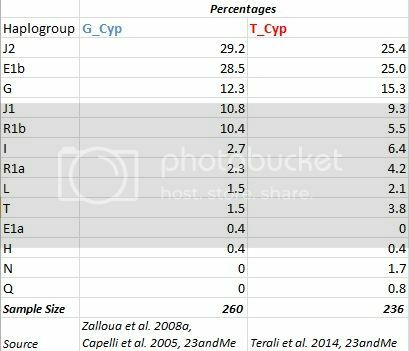 I think the similarity between the results obtained from Cyprus’ Greek majority and the Turkish minority indicates that the Y-DNA haplogroup frequencies I have collated are a reasonable estimate of that which can be found on the island. I would have liked to include data from Cyprus’ Maronite community too, and while I came across some results from them, the low number of samples and the fact that some of the markers tested for are very upstream (i.e. M89) means the results I have for them are, unfortunately, not as informative. You can find the relevant file here, under Supplementary Table S3. The Greek Cypriot Y-STR values from Zalloua et al. are not enough for me to do much with them (e.g. they are rarely enough to accurately predict subclades of J2). However, the higher number of markers for the Turkish Cypriot samples means they can be used as a reasonable proxy for Cyprus, given the overall similarity shown in the table. In addition to Whit Athey’s Haplogroup Predictors (one of which I have linked to above) I have also found this site to be useful for predicting subclades, particularly for Haplogroup E in this case. - J-M67 appears to be fairly common in Cyprus and makes up around half the J2 samples – I came to 30 of the 253 samples from Terali et al. being J-M67, which means ~12-15% of Cypriot males may be J-M67. The Cypriot results I can see on 23andMe seem to support this figure, with just over half the J2 individuals being J-M67. With the exception of some regions of Turkey - not the country overall, where J-M67 is at about 6% - this would give Cyprus the highest frequency of this subclade outside the Caucasus, closely followed by Crete. - J-M319 may be the second most common subclade among Cypriot J2s, based on a notable number of ‘J2a1e’s among those on 23andMe and 8 of the 61 J2s of Terali et al. being predicted as J-M319. Among the literature, this has been found at a relatively high frequency in Crete (~9%) and in Moroccan and Iraqi Jews. - About 90% of the J2 is J2a, with the remaining 10% being J2b. The proportion is similar among Zalloua’s Cypriot samples (12.5% J2b). This is higher than the 7% observed in Turkey, but much lower than the 30% I come to for Lebanese Maronites (I’ll make a post on this later). - E is dominated by E-V13 and E-M123 (likely E-M34). 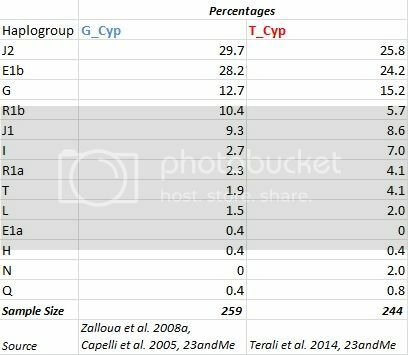 Although E-M123 was dominant among Zalloua’s Greek Cypriots, E-V13 appears slightly more common among the Turkish Cypriot results – on 23andMe, E-V13 is also slightly more common than E-M123 among the Cypriot results I can see (mostly Greek). In any case, these seem to be the two main E subclades on Cyprus. Smaller numbers were predicted to belong to other groups like E-V22, E-V12 and E-M85. - Most of the J1 appears to be J-P58 and almost all of the G is G2a. There is just one individual who is likely to be G1 and two whose results are unclear. - The frequency of J1 and G seems closer to Anatolia than the Levant, while the higher frequency of E1b relative to both is more similar to that observed in SE Europe. Do you know whats the frequencies of G2a M406 and P303?